Many fungi belonging to this group cause diseases that may destroy the hosts. Their brackets are usually horizontal. Under the bracket structure on the lining of the pores, spores are produced to fall into air currents for dispersal. These pores may be tubes as narrow as 0.1mm. Sometimes the spores may be visible as a powder substance below the bracket as in the rainforest, currents are slight compared to other areas. Pore fungi are thought to have evolved from gilled fungi and are regarded as more advanced in relation to spore production. The name Polypores is often used for a group that includes many of the hard or leathery fungi, which often lack a stem, growing straight out of wood. Their hardness means they are very resilient and can live for quite a long time, with many species even developing beautiful multi-coloured circles of colour that are actually annual growth rings. The group includes many different shapes and forms that are common in the tropical forests, including the hard 'cup fungi' and the 'shell', 'plate' and 'bracket' fungus commonly found growing off logs and still standing dead trees. These often grow in semi-circular shapes, looking like shelving growing out of trees. 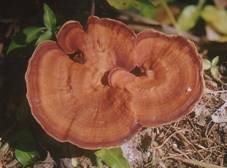 One of the more common ones, Ganoderma spp, can grow large thick shelves that may contribute to the death of the tree, and then feed off the wood for years after.